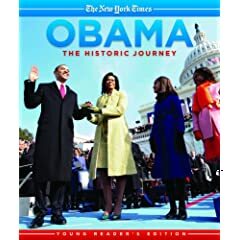 I just finished reading Obama: The Historic Journey. I like to have a sense about what I might read to my kids. For example, just today we picked up Flat Stanley: His Original Adventure! but first we had to read the synopsis of Ralph and the Motorcycle and George’s Cosmic Treasure Hunt (Joshua, I assume you will be getting this for your nephew at some point) (we settled on Flat Stanley). Since I wasn’t sure what to expect, and Elliot already has plenty of opinion about Obama and the election – I wanted to read the book entirely before he could have any part of it. Overall I liked the book. The pictures were fantastic. There wasn’t anything in there that I hadn’t read during the election. But then again, as we all recall, I was a littl obsessed during the election. There were a few things that I thought could be left out, some over-editorializing. However, the book is published by the New York Times – so it stands to reason that there’d be opinions stated.There’s an entire page dedicated to Sarah Palin being mocked by SNL, going so far as to explain some of the jokes. The publisher lists the intended audience as 9-12 year olds. If I did my math correctly, that would be 3rd through 6th grades. I think that’s probably about right for the writing level. However, I think most kids that age remember the election personally since it wasn’t that long ago and since they’re old enough to watch TV and use the Internet. In a few years kids won’t reference books for their history, it’ll all be online. The book was published in mid-February. That did allow the authors enough time to list who Obama was nominating to his cabinet but not enough time to definitivly say what sort of dog the Obama family would get (either Labradoodle or Portuguese water dog … no mention of pound puppy). Maybe that’s the incongruency for me, it doesn’t seem to be written to a specific audience. Elliot, age 5, would care about the dog and what sort of plane Obama flew around in during the campaign, what sports he played in high school, what was his favorite food in college. Older kids would probably be more interested in the social ramifications of the first black president. Sadly, the book doesn’t go into depth in either case. However, at 94 pages it does provide a nice pictorial history of the election without slamming Sarah Palin, too much. Thanks to MomCentral for the chance to review Obama: The Historic Journey. I suffer from analysis paralysis. Or I make rash decisions. I do both. In unequal amounts. And there is no pattern. I also like to remake decisions that cannot be remade, hypothesizing the different outcomes. Take for example our most recent home purchase. I think it’s because I’m not comfortable with how we came to our decision. Peter points out repeatedly that you make the best decision you can with the information you have and that’s that. Remaking the decision isn’t worth anything because you always have more information now than you did then. He’s right. I know he’s right. When I was offered Suzy Welch’s 10-10-10 book, I jumped at the chance to gain some control over my decision making. Or at least some insight as to how sane people act. Once I put Suzy Welch together with Jack Welch I recalled the turmoil that surrounded their getting together. I wondered, as I read, how was she going to handle that part of her life? She was using so many personal stories would she mention it, would she gloss over it? She addressed the matter head-on without delving too deeply – I respect her for that. If she had just glossed over a very sensational part of her life I am not sure I would have been able to continue the book. Without addressing it I think she would have seemed very Pollyanna. Who takes advice from Pollyanna? Her book arrived at a time I was trying to make a decision about the kids’ preschool situation. Elliot is headed to Kindergarten in the Fall and will attend after school care at his school. Audrey still has another year of preschool before she enters the public school system. Should I move Audrey to another school for only one year? I decided to apply Suzy’s 10-10-10 technique to my decision. Each 10 represents a time period: the immediate future, the near future and the distant future. It could be 10 minutes, 10 months and 10 years or it could be 1 day, 5 months and 3 years. Each situation will have its own time constraints. In the immediate future it would be hard to move Audrey to a new school. She’d miss her friends and some of her teachers. She has the routine at that school down. Jumping forward to the far distant future, it wouldn’t matter if I had moved her or not. By then she would have experienced so many changes that what happened at 3 1/2 would have been a blip on the screen. But that middle 10, the next six to ten months … that would be the killer. If I left her at the current preschool she would advance into the classroom that Elliot is now. Into the classroom where I have weekly conversations with the director about my concerns. Into a classroom where I’m not thrilled with the teaching techniques nor the diligence. Into a classroom that I’m not convinced Audrey would thrive in. It became very clear. And my decision was much more reasonable. It wasn’t a snap judgment based on one bad day at school. And it’s not a decision I will remake and remake, because I know why I made the choice I did. Then another question popped up … should I move them for the summer? I had enough additional incidents that it seemed worth considering. But now it’s not just Audrey. It’s Audrey and Elliot. He’s already changing schools in August. Did I want to move him twice? I employed 10-10-10 again. But this time I asked Elliot for additional information. Was he interested in changing schools? I gauged his reaction to the idea and we moved forward. The choice was made a lot easier because I had more information and a methods to sort through it. There was a lot of “I feel” and “I think” but not in the crazy ranting sort of way. We decided to move the kids to the new preschool starting June 1. Elliot will change schools twice in the next four months. He’s completely nonplussed. I’m comfortable with the decision because I looked at it rationally and then I made a choice. I’m sure that without 10-10-10 I would have come to the same decision. I am also sure I have been remaking the decision every week this summer. With 10-10-10 I applied logic to the problem. I’m at peace with the decision because it was thoughtful, not knee-jerk. That house we didn’t buy? It was cute! It had turn dial light switches a la 1950. And pocket doors. And the tile in the bathrooms was original pink (upstairs bath) and canary yellow (downstairs bath). But the roof was falling in. And the demographics of the neighborhood were older folks how had long ago sent their kids out into the world; our kids wouldn’t have had playmates. From a community perspective, we would have been lonely. This location is a much better choice for our family. But I would have had lovely retro bathrooms in the other house. Do you want some insight into how other people make decisions? Leave me a comment before April 30 and you’ll be entered into a drawing to win my copy of 10-10-10. Last year at Thanksgiving Peter took the kids to visit his parents for two weeks. He and the kids would occasionally head into town to feed Peter’s caffeine needs. Sometimes they’d want to go a park. You’d think that since Peter grew up there he might know where the parks are, but you’d be wrong. Things have changed and it was a long time ago. Also, it’s funny what you don’t pay attention to when you don’t have kids. Apparently playground locations is one of those things. Peter did try to ask the internets about parks, but he got no love. And at the time there wasn’t a good park site with user generated content. KaBOOM! to the rescue. With a quick query in the “Find a Playspace” section I found 4 parks that were in the general vicinity of Peter’s dealers Peter’s coffee haunts. But KaBOOM! is so much more than just a place to find a playspace. KaBOOM! is a national non-profit dedicated to bringing play back into the lives of our children. We passionately believe that play has purpose. We are driven to create a movement in support of this belief. To create this mass action we do three things. We facilitate building innovative, kid-inspired playspaces, using a community-build model which improves the well-being of the children we serve as well as the communities in which they live. We create platforms and opportunities for the collaborative sharing and continual improvement of knowledge and tools needed for anyone to build playgrounds on their own. And we are advocates of the importance for each child to have a safe and engaging place, as well as the time, to play—knowing that this experience makes children happier, fitter, smarter, and more socially adept and creative in the here and now and in the future. Sure, you can find a park in a town unknown to you or an unknown park in your own town. They’re trying to make a difference in the lives of children everywhere. Read what inspired the founders to act and I dare you not to be moved. I want you to be moved. On Friday, May 1 I’ll draw a name from the commentors that leave a link to their own KaBOOM! submissions. Log into KaBOOM!, add your playspaces to their database, leave me a comment linking to your addition(s) and you’ll be entered in a drawing for a $10 Amazon gift card (or $10 Starbucks card, your choice). Additionally, KaBOOM! is running a contest to add 100,000 playspaces in 100 days … two-time Dancing with the Stars winner Julianne Hough is donating $1 per addition to the KaBOOM! database. You can win prizes there too! So, go and document your playspaces! And even though I am not eligible to win my own drawing, I’ll post some of our parks too. When Elliot was small Backyardigans became available in our market. We bought the DVDs because finally! kids shows that didn’t make me cry! I just asked him if he liked Backyardigans. He said, “Not anymore. It’s kind of a little kid show.” This led to Audrey asking to watch Backyardigans. So, you can see that we have a diverse audience when it comes to television viewing. Who doesn’t love a pirate? I mean really? 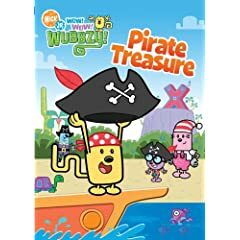 As it turns out, everyone in this test audience enjoys Pirate Wubbzy. Personally, I enjoy Wubbzy’s friend Widget. Widget is a girl! And pink! And she uses tools! And the boys like her! I like that Widget often solves the physical problems the band of friends encounter. Walden is “the smart one” and he often explains the lesson learned on their adventure. In Pirate Treasure Wuubzy found a map and convinced his friends to search for the hidden treasure. They were game but not entirely convinced. Wubbzy kept telling them they just had to believe. And in the end? (spoiler alert) The treasure was their adventure! I asked Elliot his favorite part. He said, “I liked it all so much I forgot my favorite part.”He honestly laughed at certain parts. That’s relatively new for him. Honest-to-goodness LOL. There are six other Wow! Wow! Wubbzy episodes on this disk. When they are together the fun never ends. At least not for 82 minutes. When offered the opportunity to “blog tour” Woogi World, I jumped at it. Elliot is in the right demographic and he’s been asking more and more to play on the computer. With Peter and I both being computer professionals we know our children will use computers. We know that the Internet is a large and wondrous place. Of course, I worry about Internet safety. I worry more about addictive personalities and meltdowns about limited screen time though. Woogi World wants to help teach children to balance their computer activity with real-life activities. And they want our kids to be safe while participating in on-line activities.